Over the past several weeks, San Pedro Town residents have expressed frustration over the island’s water shortage and periodic low water pressure. On Monday, April 9th via a press release, the island’s water service provider Belize Water Service (BWS), informed San Pedro Town residents that the shortage was due to their potable water supplier, Consolidated Water Belize Limited (CWBL), not meeting the demand of the island during high peak periods like the Easter Holidays. The water shortage issue first arose in the San Mateo Area, north of the Sir Barry Bowen Bridge. At the time, BWS told The San Pedro Sun that the issue was temporary, as they were upgrading the pipeline that provides water to the residents of that area due to an increase in demand. According to BWS, due to work being done, the water supply was being affected in the area. However, the water shortage soon expanded throughout San Pedro Town. Despite notifications on social media claiming ‘ongoing works at the pumping station’, their press release says otherwise. According to BWS, the company has a long-term binding contract (2004-2026) with CBWL. BWS further states that the contract was ‘negotiated with, and agreed to by, the foreign investor, Cascal BV, who held the majority ownership of BWS from 2001 to 2005.’ The release further states that the contract prohibits BWS from producing or purchasing potable water from any other third-party entity. In response to BWS' statement, Production Manager for Consolidated Water Company Ltd., Kenneth Crowley, shared the following with The San Pedro Sun. “Under our contract with BWSL, we are required to produce and deliver the quantity of water which is specified in the contract. Over the past several years we have consistently produced and delivered well above that quantity to BWSL. The contract contains a mechanism whereby BWSL can call for a “demand study” and increase the quantity of water we are required to produce and deliver to them. BWSL has never invoked this demand study mechanism in spite of our numerous requests. 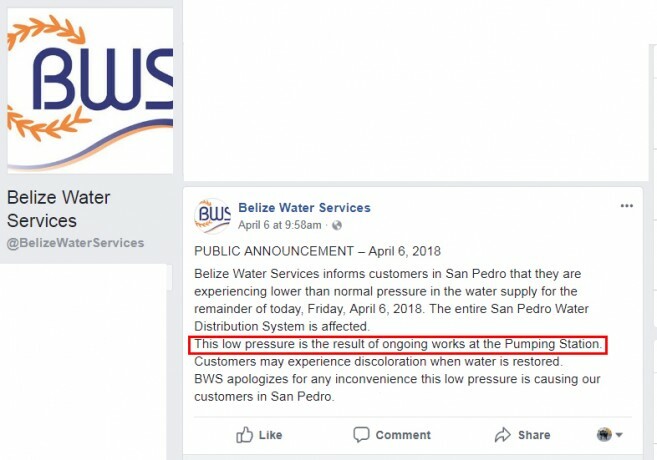 Consolidated Water Belize has always and will continue to meet its obligations under its contract with BWSL and is not causing the current water shortages in San Pedro.” Crowley is responsible for water production at all of Consolidated Water Company Ltd.’s facilities, including the plant on Ambergris Caye. The issue of water shortage in San Pedro Town is not a new one. In fact, in 2011 The San Pedro Sun reported that the Public Utilities Commission, at the request of the San Pedro Business Association, ordered BWS and CWBL to comply with an order to provide adequate and quality water supply to Ambergris Caye. At the time, BWS indicated that CWBL had issues regarding fouled membranes and thus could not meet the normal capacity. 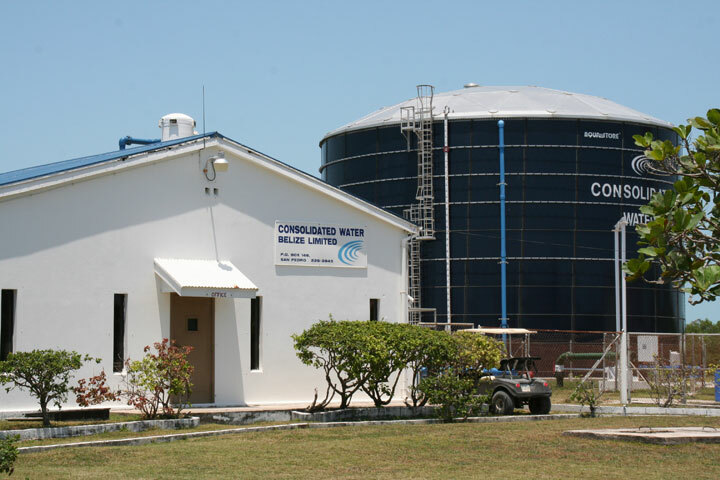 The following year, former plant manager at CWBL alerted residents that a water shortage was imminent during the Easter holidays (a typically high traffic time on Ambergris Caye). Again, BWS responded by reiterating that their contractual agreement with CWBL had them in a bind, and that they had been requesting an increase in production since 2005 to no avail. Now in 2018, the same issues are being raised, with no solution forthcoming, adding to residents’ frustration. “I have to be filling buckets, bins, and other containers for backup,” said a concerned DFC resident. “Even when there is water, the pressure is very low. I hope that this issue gets solved as soon as possible.” Business owners are concerned with the ongoing water shortage affecting their business. “This not only affects the residents of the island but also our tourism industry. Tourists come from a long day out on the sea and they want to take a bath and there is no water. That doesn’t look good for businesses. With Ambergris Caye being one of the most touristic areas of Belize, we should not be having this kind of issue,” said one frustrated hotelier. The water shortage and low pressure in San Pedro Town are expected to continue, at least for this upcoming week. BWS Operations Manager, Dave Pascascio says that the company is fully aware of the dire situation on the island. “We are working together with the CWBL to solve this problem. This is not a situation that we can fix in one or two days; it will take time, that’s why we ask residents to have patience. The water shortage and low pressure will continue on the island,” said Pascascio.